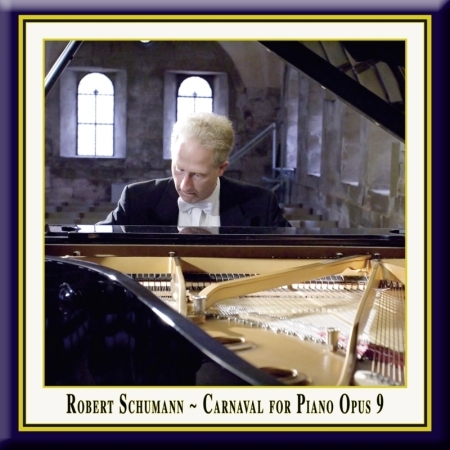 SCHUMANN: Carnaval for Piano, Op. 9 "Little Scenes on Four Notes"
"Little Scenes on Four Notes"
DDD · Duration: 31 Min. 35 Sec. n July 1990 Rolf Plagge became the first German pianist ever to win a prize in the prestigious Moscow Tchaikovsky Competition. He had already been awarded numerous prizes in national and international competitions in Vienna, Bratislava, Montevideo, Bonn, and several times in Italy. In 1987 he won the 3rd prize in the esteemed 'Reine Elisabeth' Competition in Brussels and has since been a frequent performer in Belgium. Rolf Plagge is regularly performing in many European countries, including Russia, as well as in the US and Latin America, Japan, South Korea, South East Asia, Australia. Apart from giving solo performances with various German orchestras (State Symphony Orchestra of Thuringia, Bochum Symphonic Orchestra, Bremen Philharmonic, Munich Chamber Orchestra, Rheinische Philharmonie, Staatsphilharmonie Rheinland-Pfalz etc.) as well as with international orchestras, including Baltic Philharmonic, Filharmonia Narodowa Warschau, Orchestre National de France; Polish Chamber Philharmonic, Salt Lake City Symphony Orchestra, Israel Sinfonietta, Orchstre National de Belgique etc. Plagge was born in 1959 in Westerstede, North Germany, where he received his first piano lessons at home. By 1969 he was studying at the Bremen Conservatory with Prof. Peter-Jürgen Hofer. After winning several prizes and scholarships he continued his studies with various famous teachers: in Freiburg with Vitaly Margulis, in Vienna with Paul Badura-Skoda, at the Juilliard School in New York with Gyorgy Sandor and finally in Hannover with Karlheinz Kämmerling. Since 1991 he is holding a teaching position as professor at the University of Music "Mozarteum" in Salzburg, also giving piano masterclasses in Europe and many other countries, including US, South America, Japan, Korea, Australia. Another great piano recital from K&K...This is a special one! Another great piano recital from K&K... His easy virtuosity leaves him free to voice the chords at every moment, and there are many moments of sheer magic in all the chosen works. I would mention, for example, his compelling interpretation of one of the most elusive and problematic of Schubert's sonatas, the first movement thoughtfully dramatic, and the slow movement exquisite... This release is a special one!